Book Measures 8" by 6"
You have created a beautiful nautical motif for your reception, so complement it with our sea shell guest book and pen set. A wonderful addition to enhance your beach themed favors, this set is a symbol of the peace and tranquility you find at the beach. The guest book measures 8" by 6" and includes a luxurious white satin cover with pleated satin and sea shell adornments, as well as scattered pearl accents. 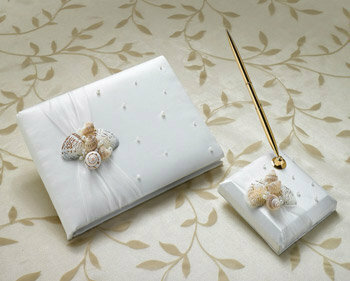 The gold pen rests in a 4" square base with matching satin, sea shell and pearl embellishments. A wonderful greeting for all your guests, the sea shell guest book and pen set is an essential element to your beach themed wedding. This product will be shipped from Wisconsin. See below for transit time (in business days) for Ground Service. Transit times do not include order processing time. See shipping info for details. No customer submitted images yet.